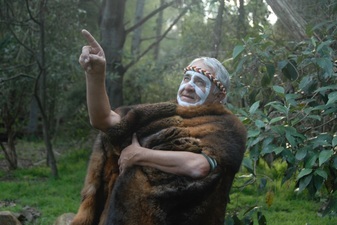 Murrundindi works closely with The Log Cabin Ranch to educate students and teachers alike about the local knowledge and history of the Wurrundjeri Aboriginal Culture in Australia. He happily runs workshops on site or you can take a trip into Heaslville Sanctuary. Murrundindi works in with The Australian Curriculum to ensure that all outcomes are met when learning about Indigenous Studies. If this is a subject area which you are keen to learn more about, look no further than the 'Head Elder of the Wurrundjeri Tribe - Murrundindi. ​You can't get more authentic than this! Looking at getting Murrundindi in to work with your school?